Have you ever noticed that each place has its own distinct set of colors? 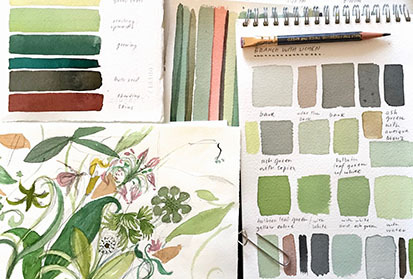 This watercolor workshop explores the colors that make up The UC Botanical Garden. Through classroom and garden we will develop color palettes that reflect this remarkable place. Learn and refine your color mixing skills, and how limited palettes can create a wide range of subtle color. The workshop is for both the experienced artist and the complete novice, as well as travelers looking for a unique and memorable way to capture impressions of places. Mimi Robinson is an artist and author of the book Local Color-Seeing Place Through Watercolor," available for sale at the UCBG Gift Shop.